Our longest heated grip, designed with the Honda Goldwing in mind. IMPORTANT: PLEASE READ THIS WARNING: IMPORTANT: Please email Jim@hotgrips.com before ordering, as there are different diameter throttle tubes which have caused problems and concerns for Honda Gold Wing purchasers. In brief some throttle tubes from Honda are 1.000" and some have been reported as 1.050" and even one as large as 1.080" diameter. While you can file down the throttle tube diameter to fit our grip's inside diameter, you CANNOT enlarge the interior of our grip so easily. In fact even with our methods it is extremely difficult and time consuming because our grip interior consists of many grooves which will violently catch attempts to "ream" it larger. We have developed a technique of using a 3-jaw chuck on a lathe and opening it up a little with a special boring bar cutter, then using a 400 degree F. heated aluminum bar to melt it out to 1.050" if absolutely required by a particular customer. It leaves a mess inside the grip interior of melted polymer but it does enlarge it. Not a DIY job in my opinion. Many other riders, looking for a bit more grip width, are also selecting this grip and we do maintain the same "watt-density" per square inch of exposed grip area regardless of which length grips you order.. Features our patented "burn-out proof" heating elements. We use .022" to .025" diameter furnace wire- depending on the watt-density we need for a particular grip length. It is designed to withstand being red-hot in service for other products, so we are not manufacturing a product that will burn out like a printed circuit. 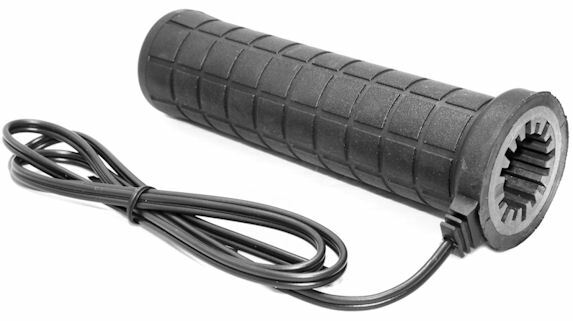 We use a minimum of 72" of wire in each grip, and it does not have unheated areas like the Chinese heated grips. This "Comfort-Sized" grip naturally reduces wrist and hand stress. Our unique Heat Isolation Ribs reduce heat transfer to the handlebars and keep the heat where it is needed - the rider's hands. IMPORTANT: PLEASE READ THIS WARNING: IMPORTANT: Please email Jim@hotgrips.com before ordering, as there are different diameter throttle tubes which have caused problems and concerns for Honda Gold Wing purchasers. In brief some throttle tubes from Honda are 1.000" and some have been reported as 1.050" and even one as large as 1.080" diameter. While you can file down the throttle tube diameter to fit our grip's inside diameter, you CANNOT enlarge the interior of our grip so easily. In fact even with our methods it is extremely difficult and time consuming because our grip interior consists of many grooves which will violently catch attempts to "ream" it larger. Dual Heat is standard with all our grips providing high heat, low heat or no heat. Other options, including variable heat, are available. A Variable Heat Controller can be installed and also makes wiring a set of grips super easy. See our controller by clicking on accessories. CUSTOM OPTIONS - all our grips come stock with a high/low/off toggle switch. However you can select a variable heat controller, mini toggle switch or handlebar mounted switch as options. Inside Diameter: Left ID = .875" and right = 1.000"